Background: Renal colic is a painful medical emergency, needs urgent intervention to reduce pain. Nonsteroidal anti-inflammatory drugs, opioids, and entonox are pain-relieving agents. This study was aimed to compare fentanyl + entonox (nitrous oxide + O2) versus fentanyl + oxygen. 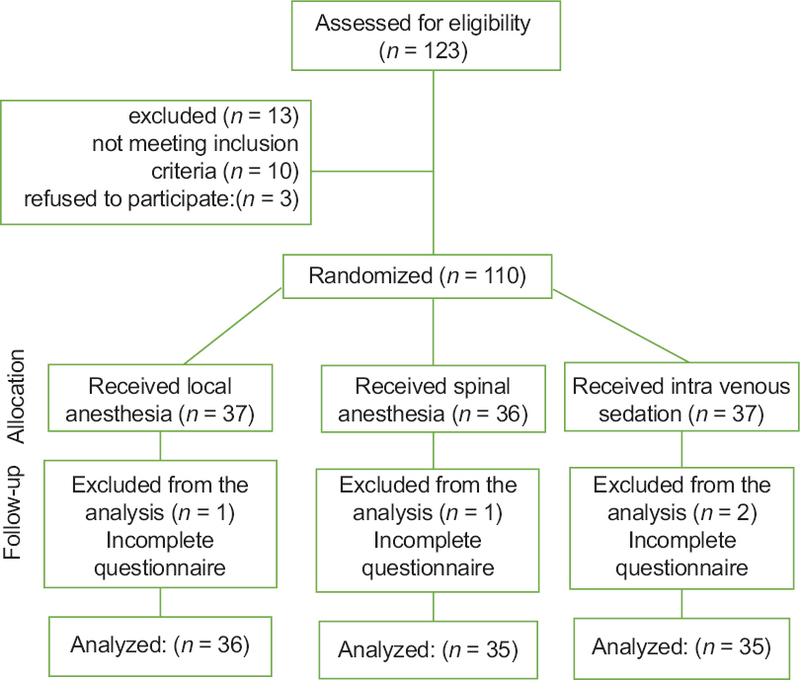 Materials and Methods: One hundred and twenty patients with acute renal colic presenting to the emergency department were enrolled. First, 50 μg fentanyl was infused for all patients. Then, patients divided into two groups receiving masks of entonox and oxygen, respectively. Quantitative measurement of pain was performed by visual analog scale, before the intervention, after 3, 5, 10, and 30 min of that. If the pain was not relieved after 30 min, 50 μg fentanyl was infused. If the pain was still continued, ketorolac and ketamine were used. 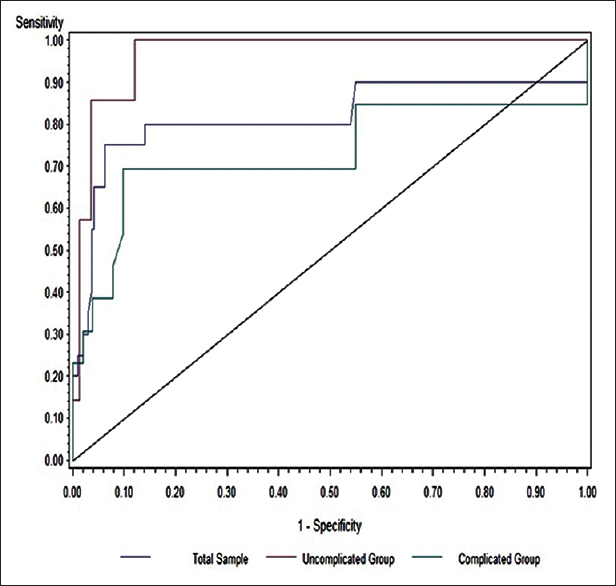 Hospitalization duration and severity of pain at specified times were compared between patients in two groups. Results: The mean (standard deviation) time of hospitalization was 211 (59) and 236 (61) min in fentanyl + entonox and fentanyl + O2 groups, respectively (P = 0.024). The decrease in pain severity after 10 and 30 min in fentanyl + entonox group were significantly greater than fentanyl + O2 group (P = 0.002 and 0.001, respectively). Mean (standard error) of needed time for renal colic pain to get better was 11.27 (1.23) and 20.47 (1.71) min in fentanyl + entonox and fentanyl + O2 groups, respectively (P < 0.001). Proportion of patients relief from pain in fentanyl + entonox in the second, third, and fourth measurements were significantly more than fentanyl + O2 group (P = 0.036, P < 0.001, and P < 0.001, respectively). Conclusion: Entonox is more effective to decrease the duration of hospitalization and reduction of pain than O2 in renal colic patients. Background: Metabolic control is a major concern in preventing diabetic complications. Saffron as a natural source of antioxidants could play a role in alleviating diabetes insults. The aim of this study was to investigate effect of saffron hydroalcoholic extract on metabolic control in type 2 diabetes (T2D) mellitus. 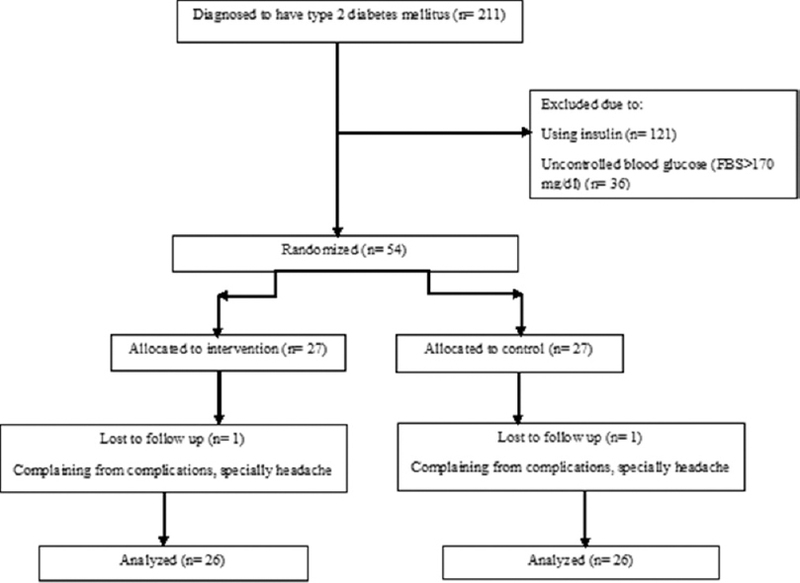 Materials and Methods: This randomized triple blind study was included 54 T2D patients which randomly received either saffron (Group 1) or placebo (Group 2) twice daily other than routine antidiabetic treatments for 8 weeks. Serum concentration of fasting blood sugar (FBS), 2-h plasma glucose, hemoglobin A1c (HbA1c), total cholesterol, triglyceride (TG), low-density lipoprotein, and high-density lipoprotein were measured as the markers of metabolic control. Anthropometric measures and blood pressure were also measured at the baseline, every 2 weeks during the intervention and the end of the study. Data analyzed using repeated measure analysis of variance test. Results: The baseline metabolic parameters were the same in two group (P > 0.01). FBS serum level significantly decreased within 8 weeks in the saffron group (128.84 ± 31.86) as compared to the placebo (153.76 ± 41.23), (P < 0.001). There was no statistical difference in other metabolic parameters such as serum lipids, blood pressure, and HbA1c (P > 0.01). Conclusion: Saffron hydroalcoholic extract may improve blood glucose control by reducing FBS in T2D patients. However, saffron extract has no significant effect on other aspects of diabetic control in diabetic patients. Background: Nonmelanoma skin cancer (NMSC) in renal transplant recipients is common and associated with significant morbidity and mortality. The aim of the present systematic review and meta-analysis was to estimate the incidence of NMSC among renal transplant recipients. 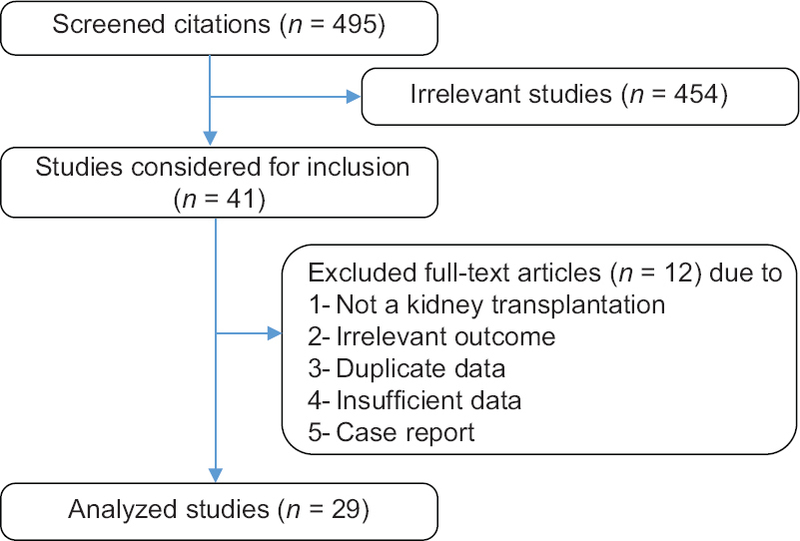 Materials and Methods: We systematically searched PubMed, Medline, Scopus, and Web of Science databases for studies that assessed the incidence of NMSC in renal transplant recipients using a combination of relevant keywords. Two independent investigators included studies and extracted necessary information. Random effect meta-analysis was used to estimate pooled incidence of NMSC with 95% confidence intervals (CIs). Results: Twenty-nine studies comprising 36,021 patients meet the criteria for the systematic review. The pooled incidence of NMSC in renal transplant recipients was 12.6% (95% CI: 12%–14%) with a majority of squamous cell carcinoma (SCC) 55% (95% CI: 47%–63%). The pooled estimate of the incidence rates of SCC and basal cell carcinoma was 2.7% (95% CI: 2%–3.4%) and 2.2% (95% CI: 1.5%–2.8%), respectively. Subgroup analysis per geographic location showed that pooled incidence of NMSC was 39.1% (95% CI: 26.3%–51.8%), 12.4% (95% CI: 8.8%–16%), and 1.2% (95% CI: 0.4%–2%) in Australia and New Zealand, Europe, and Middle East, respectively. Conclusion: The results of the current meta-analysis demonstrated that the incidence of NMSC in renal transplant recipients varies widely. Regarding the high incidence of NMSC among renal transplant recipients, awareness of associated risk factors and early diagnosis of the malignancy in the population is a major clinical need. Background: Early prediction of adverse neonatal outcome would be possible by Doppler impedance indices of middle cerebral artery (MCA), umbilical artery (UmA), and descending aortal artery (AO) that result in decrease neonatal morbidity and mortality rate. The aim of the present study was a determination of optimal value for the ratio of MCA to descending aorta blood flow (MCA/AO) impedance indices and its comparison with the ratio of MCA to UmA (MCA/UmA) impedance indices and their relationship with neonatal outcome. Materials and Methods: This was a prospective cohort study on 212 pregnant women with gestational age 36 weeks or more, in three hospitals in Tehran, from April 2012 to April 2013. We investigated AO, MCA, and UmA impedance indices Doppler ultrasound every 2 weeks till delivery. The mother was monitored for adverse pregnancy outcome (hypertension [HTN], fetal growth retardation, and other maternal complications) then infant birth weight, cord blood of pH, and Neonatal Intensive Care Unit (NICU) admission during the first 24 h after delivery were assessed. Finally, we investigated relationships between Doppler indices and neonatal outcomes include neonatal body weight (NBW), cord blood of pH, and NICU admission. Results: MCA/AO resistance index (RI) and MCA/AO pulsatile index (PI) showed an area under the receiver operating characteristics curve (area under the curve) of 0.905 (95% confidence interval (CI): 0.850, 0.959) and 0.818 (95% CI: 0.679, 0.956), respectively. The cutoff values for pH (≥7.2 vs. <7.2) based on MCA/AO RI and MCA/AO PI indices were 0.951 (sensitivity, 80% and specificity, 86%) and 0.853 (sensitivity, 91% and specificity, 83%), respectively. The cutoff value for NBW (≥2500 vs. <2500 g) based on MCA/UmA PI index was 1.467 (sensitivity, 73% and specificity, 63%). The cutoff value of NICU admission of child based on MCA/AO PI index was 1.114 (sensitivity, 73% and specificity, 54%). Conclusion: In the end of third-trimester pregnancies with the assessment of MCA and AO artery Doppler ultrasonography, it is possible to prevent many cases of neonatal acidosis caused by prenatal asphyxia as well as inappropriate interventions which are applied on mother. If MCA/AO PI was <0.85, the fetus needs to be evaluated further because it is at risk for acidosis. Background: This study aimed to compare the effects of combined endurance-resistance training (CT) versus endurance training (ET) on some cardiovascular markers in patients with heart failure after percutaneous coronary intervention (PCI). 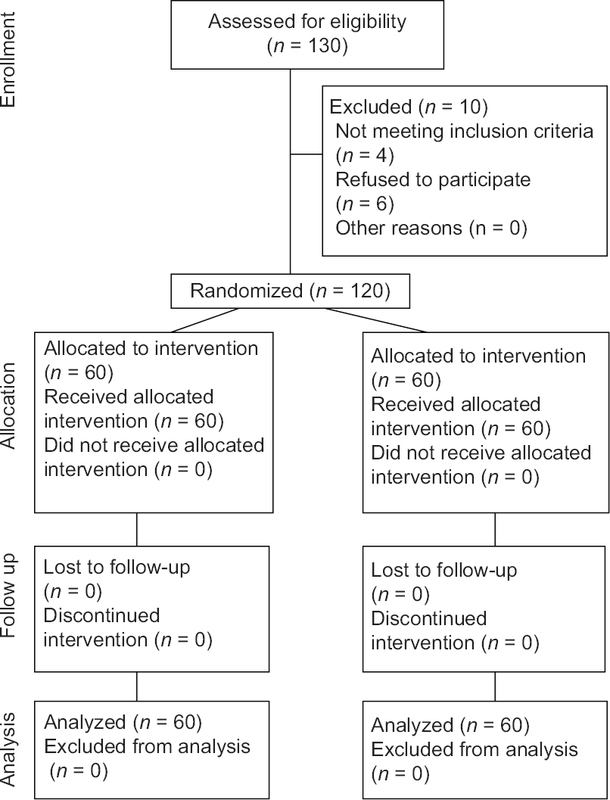 Materials and Methods: The study applied a randomized, controlled design in which 75 patients with heart failure who had undergone PCI were randomly assigned to one of three groups: ET, CT, and control. The ET group performed ET for 45 min, three times a week for 7 weeks. 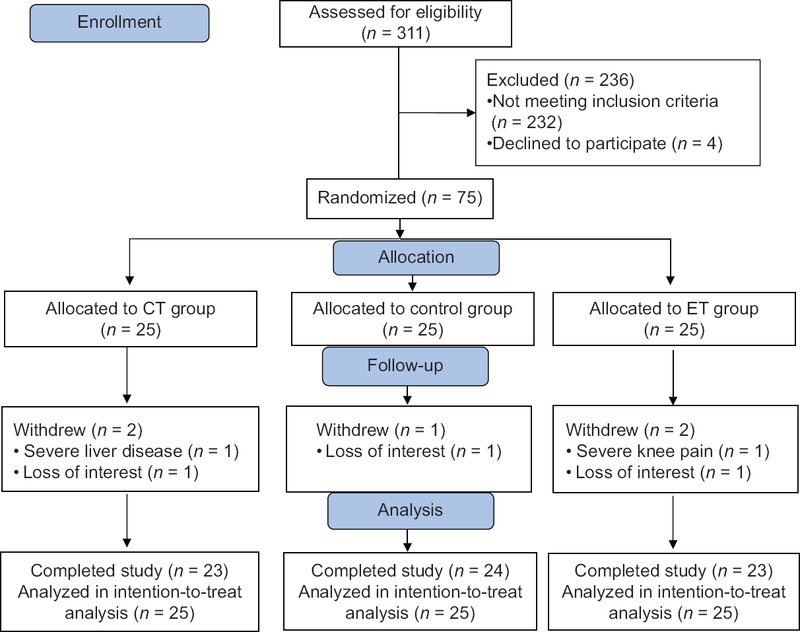 The CT group performed the same ET for 30 min followed by a resistance exercise protocol. The control group received usual care. Functional capacity, N-terminal pro-brain natriuretic peptide (NT-pro BNP), and high sensitivity C-reactive protein (hs-CRP) levels were measured. Results: After the intervention, functional capacity was improved (P < 0.001) and NT-pro BNP level was significantly reduced (P = 0.004 in the CT group, P = 0.002 in the ET group). Hs-CRP level was significantly reduced only in the ET group (P = 0.030). The control group showed no significant changes in any cardiovascular parameters (P ≥ 0.05). Changes in functional capacity (P < 0.001) in both training groups were significantly different from the control group. No significant differences were found between the ET and CT groups regarding changes in all outcomes after exercise training (P ≥ 0.05). Conclusion: Exercise training is safe and feasible in post-PCI patients, even in those with reduced ejection fraction. CT was as effective as ET in reducing NT-pro BNP level and improving functional capacity in heart failure patients after PCI. Background: Genetically, predisposed children are considered as at-risk individuals for cardiovascular disease. In this study, we aimed to compare the frequency of four-lipid regulatory polymorphism in obese and normal-weight children with and without cardiometabolic risk factors. Materials and Methods: In this nested case–control study, 600 samples of four groups of participants consisted of those with normal weight with and without cardiometabolic risk factors and obese with and without cardiometabolic risk factors. Allelic and genotypic frequencies of GCKR (rs780094), GCKR (rs1260333), MLXIPL (rs3812316), and FADS (rs174547) polymorphisms were compared in the four studied groups. Results: Data of 528 samples were complete and included in this study. The mean (standard deviation) age of participants was 15.01 (2.21) years. Frequency of tt allele (minor allele) of GCKR (rs1260333) polymorphism was significantly lower in normal weight metabolically healthy participants than metabolically unhealthy normal weight (MUHNW) and obese children with and without cardiometabolic risk factor (P = 0.01). Frequency of ga allele of GCKR (rs780094) polymorphism was significantly higher in normal weight children with cardiometabolic risk factor than in their obese counterparts with cardiometabolic risk factor (P = 0.04). Frequency of cg and gg alleles (minor type) of MLXIPL (rs3812316) polymorphism in normal weight metabolically healthy participants was significantly higher than MUHNW (P = 0.04) and metabolically healthy obese children (P = 0.04). Conclusion: The findings of our study indicated that the minor allele of GCKR (rs1260333) single nucleotide polymorphisms (SNPs) could have pathogenic effect for obesity and cardiometabolic risk factors. 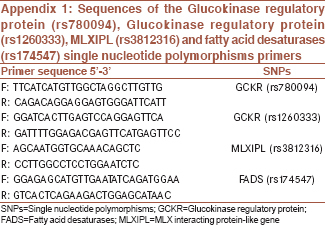 Ga allele of GCKR (rs780094) SNPs had a protective effect on obesity. Minor alleles of MLXIPL (rs3812316) could have a protective effect for obesity and cardiometabolic risk factors.